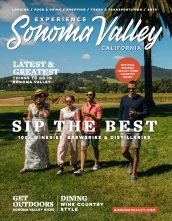 Just a short, 45-minute drive from San Francisco, Sonoma makes for an easy girls getaway destination, and its handy location at the heart of Real Wine Country, means it’s the perfect base for exploring all that the region has to offer. Whether you want to relax in five-star luxury or roam the grounds of a working vineyard, be pampered by award-winning spa treatments or visit local wineries by bike - however you want to enjoy quality time together, Sonoma is sure to make it memorable. But with so much world-class wine, food, culture, and more on offer, planning the perfect girls’ weekend can seem a little daunting. Browse our pick of Sonoma’s best girls getaway accommodation, wine tours, and more below; and get the full lowdown on all the region’s highlights in 10 Reasons to Visit Sonoma. If your dream girls getaway stars an elegant yet rustic farm stay, look no further than Beltane Ranch. Established in 1879, this iconic family-owned vineyard was voted ‘America’s Best Bed & Breakfast’ by Food & Wine Magazine, and its idyllic grounds and outdoor lounges are perfect for sunset catch ups. A homey B&B in the center of town more your style? Just minutes from Sonoma’s historic plaza, book your girlfriends rooms at An Inn to Remember. Along with Italian-style breakfast delivered straight to your door, stays include free bike rentals and complimentary wine-tasting passports. Looking to splurge on the ultimate destination resort? With exceptional spa services, a Michelin-rated restaurant, stunning grounds, and numerous complimentary offerings - from daily wine tastings to docent-led hikes to yoga classes - this historic hotel oasis makes for the perfect all-inclusive base. Offering a unique range of treatments based on the fruits, flowers and herbs grown in its own gardens, a ‘Farm to Massage Table’ experience at the Garden Spa makes for a memorable girls-only pampering session. Try a passion flower polish, lavender body wrap, and more, before enjoying the pool and other facilities. This consistent award-winner is one of the leading spas in the U.S., making it the ultimate place to indulge in a range of wine-inspired treatments - from honey wine wraps and crushed cabernet scrubs, to vinoperfect facials and vinotherapy baths. Plus, if you stay in one of Kenwood’s semi-private Poolside Cabanas (accommodates 4) you’ll get 15% off. Whether it’s biking from vineyard to vineyard on a full day adventure or an extended scenic ride to a single, secluded winery, Sonoma’s quiet county roads and accessible bike paths make it great fun to explore on two wheels. Rental bikes come with route maps and local advice, or join a signature guided-tour and leave the navigation to the experts. For a fun and sociable wine-tasting day out - complete with memorable transportation - save your group seats on a cable-car wine tour. Enjoy breathtaking views from a 20th century California trolley, as you journey open-air through Sonoma Valley, visiting four unique wineries and pausing for a gourmet picnic lunch on route. Prefer a more bespoke wine tasting experience, tailored especially to you and your girlfriends? Let the owners at Blue Star Wine Country Tours use their insider knowledge, personal contacts, and years of experience to craft the perfect wine itinerary for you. From fruit smoothies to tasty mimosas to all-day brunch, Sunflower Caffe makes for a great refuelling stop during your downtown Sonoma sightseeing. Located in a historic adobe building right on Sonoma Plaza, sit on the street or grab a spot in the relaxed garden patio. From coffee and croissants to gourmet paninis, sweet pastries, and cakes, the home-baked treats on offer at Basque Boulangerie make it a popular local spot. Buy baguettes, paninis and quiche to go, and enjoy a memorable picnic lunch at one of Sonoma’s scenic vineyards. For a homemade ice-cream fix or an after-dinner treat, head to Sweet Scoops, on the corner of Sonoma Plaza. Using fresh, local ingredients, its huge list of flavors is bound to include a few you haven’t tried before - from honey lavender to lemon gingersnap - as well as a large number of dairy free options. The friendly patio at this small, Sonoma Plaza tasting room provides the ideal backdrop for pre-dinner drinks and chats. Home to one of the best selections of Sonoma Valley wines, it’s also one of the few places in town where you can indulge in an evening wine tasting. Book ahead for 7pm. With a 1920s mahogany bar, cute garden patio, comfy cocktail lounge and award-winning Rhone-Alone wine list, this is one of Sonoma’s most group-friendly venues for everything from pre-dinner drinks to tasty cheese pairings to memorable meals based around seasonal Californian fare. An evening meal in El Dorado’s beautiful fig-lined courtyard is a perfect way to round off a fun-filled day. Complete with an award-winning seasonal menu - including plenty of light and meat-free options - a 200-plus wine list featuring several organic vineyards, and an imaginative cocktail list, you’ll have all the ingredients you need for a great evening out together. Small plates designed for sharing are the specialty at Oso Sonoma, an award-winning tapas eatery and wine bar, right on Sonoma Plaza. Featuring constantly-evolving dishes, a raw bar, and great happy hour drink and bite deals, its cozy, intimate interior provides the perfect setting for quality time.